Our small B2B start-up ran a Google Adwords campaign as part of our marketing efforts recently. 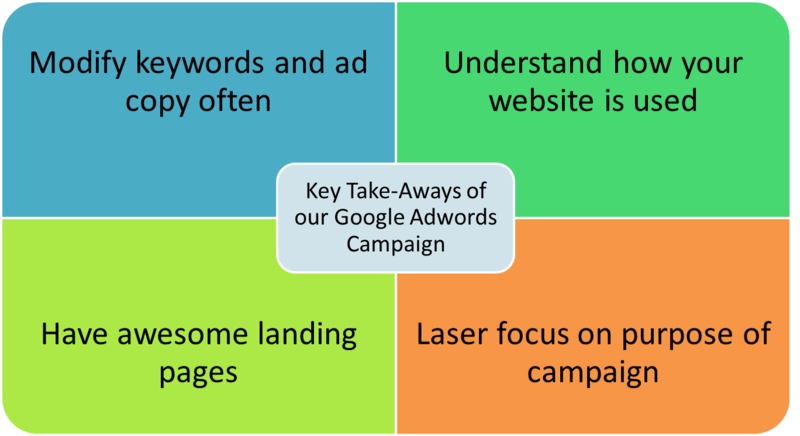 We had mixed results, but learned a lot about the Google Adwords tools. I thought I’d share our goals, results and takeaways as a way to help any company like ours (small B2B services start-up) that is considering running a Google Adwords campaign. My general advice to you would be that a Google Adwords campaign is probably not a good idea (at least not yet) for companies like ours due to where our customers generally come from: word of mouth from a trusted colleague. Our customers weren’t interested in clicking on a sponsored ad on the right side of a Google search. We saw an increase of total visits by 185.16% and an increase in unique visitors of 251.40%. The overall CTR of the campaign was 0.14% and remained between 0.12% and 0.16% throughout the campaign. We saw a bounce rate of <0.2%, 4.85 pages per visit and an increase in new visits of 32.60% while our page views increased by 108.06%. Overall we were pleased by our results. Our key takeaway was that a Google Adwords campaign requires continuous monitoring and updating to be most efficient and provide the best ROI. And that it wasn’t the right marketing tool for us at this point in our company’s development. Note: I can’t write this without thanking the amazing digital marketing team that worked with me: Alicia Midland, Erin Nilon, and Santhia Muthusamy and our adviser Valarie Zeithaml of UNC Kenan-Flagler. Connect with me on LinkedIn, Google+, Twitter (@SaraPaisner), via email, or contact me. This entry was posted in Digital Marketing, Marketing and tagged Adword, Adwords content, B2B, B2B services startup, digital marketing, Digital marketing ROI, Google, Google Adwords, Google Analytics, key performance indicators, KPIs, Online advertising, Pay per click. Bookmark the permalink.